To stop construction is not enough. Whole budget should be cut. 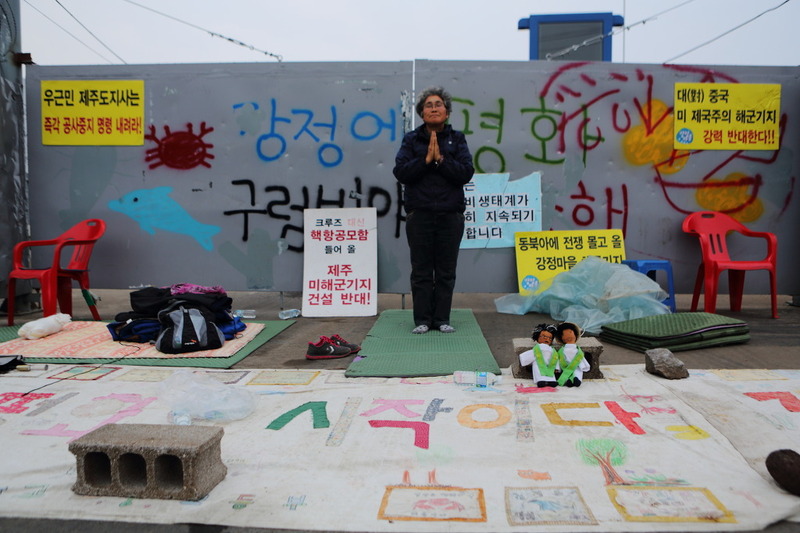 Photo by Cho Sung-Bong/ Jang Sung-Shim started fast even without water on Nov. 7 in front of the main construction gate, demanding to revoke the Jeju naval base project and free all the prisoners. “I put all myself to this.” Accidentally, Nov. 7 was the very date that martyr Yang Yong-Chan immolated himself in 1991. On Nov. 8, Moon Jae-In, Presidential candidate of the Democratic United Party, visited Jeju. He did not stop by the Gangjeong village, but mentioned on his position on the Jeju naval base project. His mention can be compared to mention by another Presidential candidate, Ahn Chul-Soo, who visited the village but still insisted on the need of the project and Park Geun-Hye, Presidential candidate of the ruling Saenuri party, who wants the Jeju, as the 2nd Hawai’i mixed of tourism and militarism. – The [technical] simulation demanded through the ruling and opposition party agreement has not been satisfied. Candidate Park Geun-Hye and the Saenuri Party (New Frontier Party) should join the budget cut. 1. Candidate Moon Jae-In visiting Jeju promised that he “would first stop construction and re-examine the project contents according to democratic procedures.’ We welcome the words, noticing that he confirmed again the position of construction stop and re-examination, the party opinion of the Democratic United Party. 2. 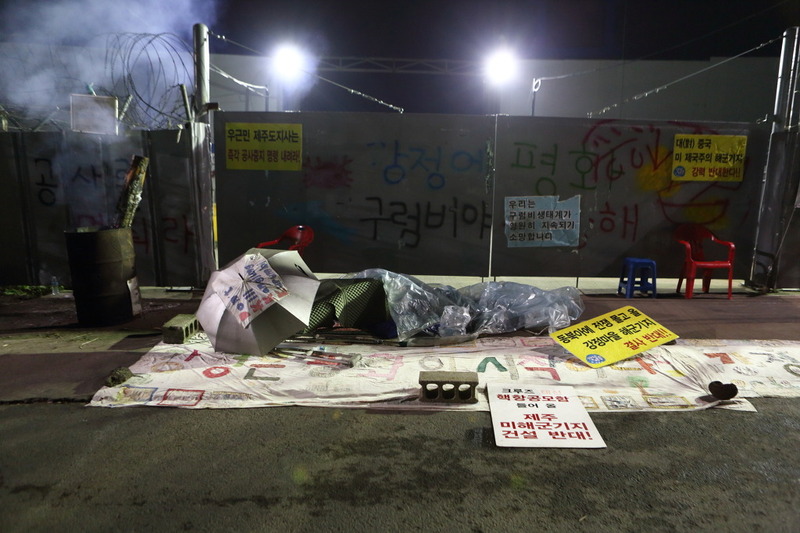 Candidate Moon Jae-in pointed out that “the Lee Myung-Bak government is unilaterally enforcing construction despite the fact that the 2012 budget was cut by the agreement between the ruling and opposition parties because the Jeju naval base project is being enforced violating the  National Assembly resolution to build it as a ‘civilian-military complex port of call (*which is focused on civilian port with the ability of two 150,000 ton cruises’ simultaneous coming alongside the pier).’ It is a very timely indication. 3. However, candidate Moon Jae-In did NOT mention on the 2013 Jeju naval base budget. When the National Assembly cut the budget for 2012 last year, the National Assembly decided to verify on the actuality of the Civilian-Military Complex for Tour Beauty(Jeju naval base) by the agreement of ruling and opposition parties. However during the discussion process by the [technical] verification committee under the Office of the Prime Minister last February, flaws in the base design have been confirmed. And it has been turned out that the proposed changed base layout that the Ministry of National Defense has suggested later has, in fact, many problems in many aspects such as in cruise ships’ turning and entry & exit of port. Further, no objective simulation on which the Jeju Island and navy agree with each other, has been carried out by now. Even though it is reasonable that the National Assembly cut the whole 2013 budget based on the ruling and opposition parties’ agreement [in 2007], no party, no candidate has not mentioned on it yet. 4. Candidate Moon Jae-In and Democratic United Party have to clearly declare their position and carry it into practice for the whole budget cut on the 2013 Jeju naval base project to stop construction (destruction), beyond the reconfirmation on its position of construction stop. 5.Together with Moon, the ruling Saenuri Party(New Frontier Party) and its candidate, Park Geun-Hye should join Moon to cut the 2013 budget on the Jeju naval base project by the agreement between the ruling and opposition parties, as verification work proposed by the agreement between the ruling and opposition parties have not been carried on and numerous problems in the Jeju naval base construction such as base design flaws and unreliablce harbor & bay (caisson) production have been confirmed again. 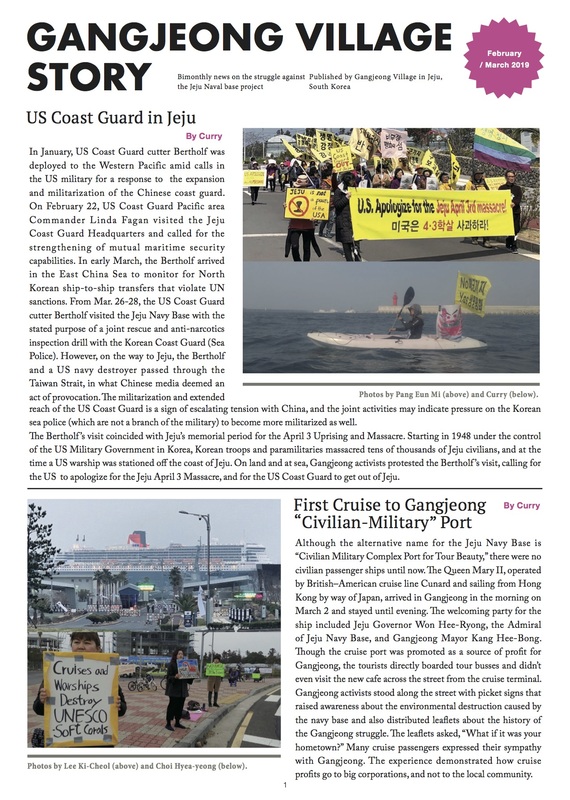 Candidate Ahn Chul-Soo (independent) should make his concrete position on the matters of the stop of the Jeju naval base construction and of the 2013 budget cut. Photo by Cho Sung-Bong/ No! Jeju US Naval Base! To my friends who would be in front of the construction gates right now. All the time of struggles by which you have delayed one construction truck even for a few minutes has filed up one by one neatly. That is why there is still 50% budget unused bccause you have stopped the execution on that amount of budget on the Jeju naval base construction. And that has become the very basis that even the members of the National Defense committee cannot easily approve the 2013 budget. Whenever the committee members are embarrassed because of non-executed budget, I remind each face of you, peacekeepers, being in front of construction site. It is all thanks to you, peacekeepers, who have endured merciless construction (destruction) and no-time defined police’s roughing out of you. Even though you may suffer from cold weather and grief, I am told of hopeful news little by little. It is thanks to you who have sleeplessly put up with those hardships there. Tomorrow is the day that the National Assembly committee makes decision on the naval base budget. It is a hard season for everyone. However NOW is the only chance. So please stir up ourselves a little more. 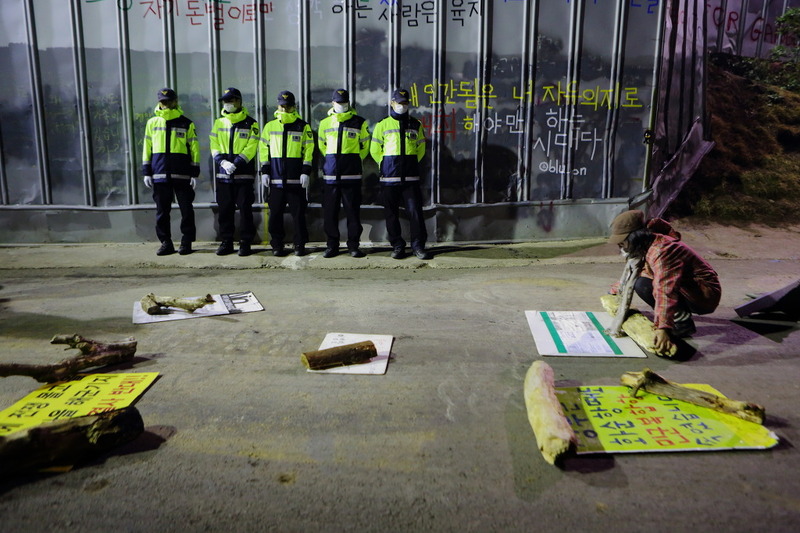 Photo by Cho Sung-Bong/ 20 year old “Pyonghwa (meaning ‘peace’)’ rearranges stuffs of signs and woods etc.. after police leaving. People put up various materials including bicycles and motorcycles in front of construction gates to delay the construction (destruction) trucks. 3. No conclusion on budget cut in the National Assembly yet. But budget matter is critical now. 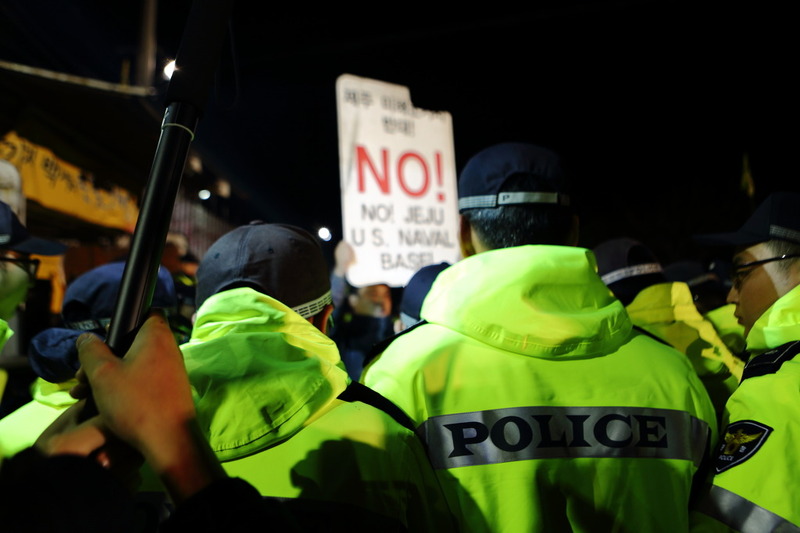 Update: On Nov. 9, the National Defense committee of the National Assembly could not reach to the conclusion on the budget of the Jeju naval base project (Related to the DAPA: Defense Acquision Program Administration) despite the meetings by its sub-committee on Budget and Balance on Nov. 7 to 8. The positions between the ruling and opposition party was quite different. Photo by Cho Sung-Bong/ People’s daily prayer and protest for peace continue in front of construction gates even though they would be soon disrupted by the police. No US Nuclear Aircraft Carrier, No Jeju naval Base against China!’ A peacekeeper Deulkkot has made two dolls of the Catholic priests. Fr. Lee Young-Chan was arrested on Oct. 24 and is in prison: 18th day as of Nov. 10. 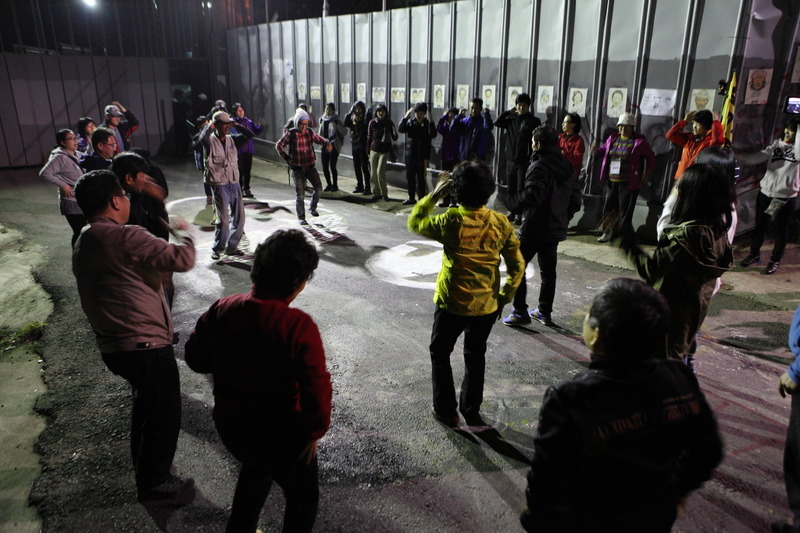 Photo by Cho Sung-Bong/ People’s dance after the daily candle vigil at 8pm in front of construction gate, despite more severe police’s roughing out of people with the 24 hour construction that started on Oct. 25.